This is a fabulous fondant recipe and tastes yummy too! This was my first time working with fondant and I will use it many, many times in the future, I'm sure. Don't get intimidated by the word "fondant"! It was easy! Over double boiler, add 2 Tbsp of the water and the marshmallows. Melt marshmallows completely, stirring constantly. Once the marshmallows are all melted, remove from heat and pour in 3/4 of the powdered sugar and give it a quick stir or two. Generously grease the counter with some of the Crisco. Repeat as necessary. Carefully dump the marshmallow and powdered sugar mix on the counter. It may be a little bit hot so be careful. Generously grease your hands as it is sticky. Repeat as necessary. If your dough is tearing easily it needs a bit more water, added 1/2 Tbsp at a time, kneaded into it. Get it to a firm, smooth elastic ball. When the dough is finished you can give it a quick coating of Crisco and double wrap it in plastic and store it in the refrigerator. When you want to work with it, just remove it from the fridge a few hours before you need to use it so it will be easier to knead. You want it to be about body temperature to roll out and place over cake. You can store it in the fridge for weeks. To add color to the fondant, use a toothpick to add in paste type icing colors. Just drag them through the dough and then knead in. (Lightly Crisco your hands again to avoid the stickiness.) The colors actually wash off your hands easily if you don't use too much so don't worry about that. Also, be sure to keep any fondant dough that you aren't working with wrapped up in plastic so it doesn't dry out. To glue one fondant piece to another, just get barely get it wet with a small amount of water and it will stick to itself. (I really couldn't believe that worked!) Be careful not to over wet it or the color may bleed, run or smear. There are lots of fondant tips on the web so look around. 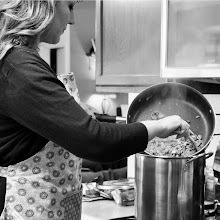 I got my recipe from this website and she has great directions and tips. 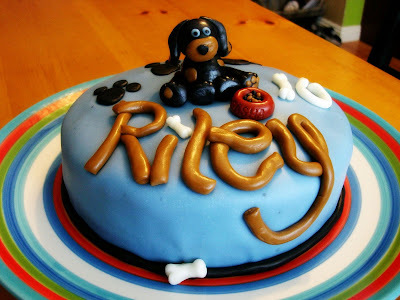 Also, I learned how to make the puppy for Riley's cake from this three part video. 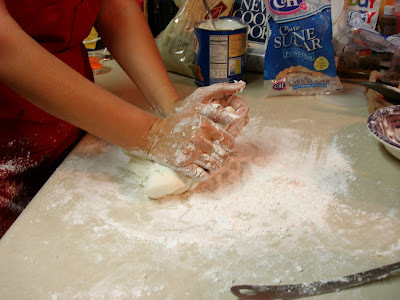 Wilton's web-site has tons of fondant tips, ideas and directions, too. Have fun! I'm game! Think I will try this for JT next month. 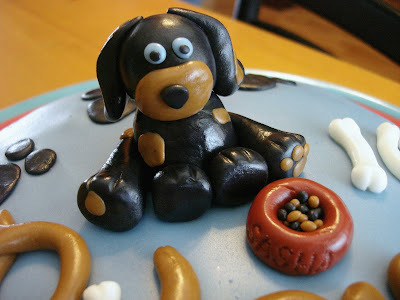 Not the dog but the fondant, always wanted to try it. It almost sounds like buttercream frosting I use but thicker. Stay near the phone in case I call for pointers. WOW, I am beyond impressed. That looks incredible. Haven't been around for awhile, but now I'm back... and loving your new header. So preeeeety.